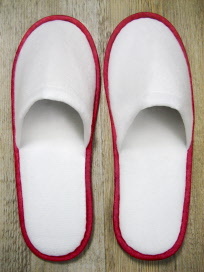 Try out a new slipper design that includes a colorful border around the edge, which won't break the bank. The cocoon-style slipper is made of a soft, brushed polyester fabric in a bright white colour. 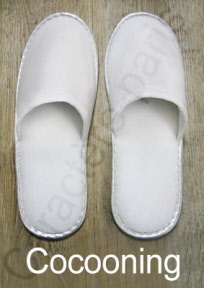 They come in sizes 6 UK (EUR39) and 9 UK (EUR 43), with a closed toe design. 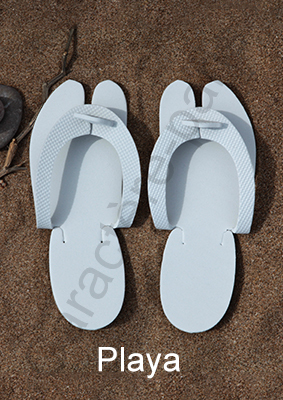 Each pair is sealed inside a ready-to-use, transparent plastic bag. 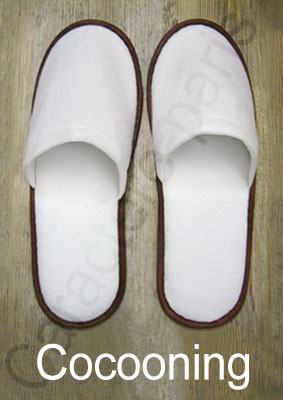 These slippers make an ideal welcome gift to leave for guests in the bathroom or bedroom of your accommodations. 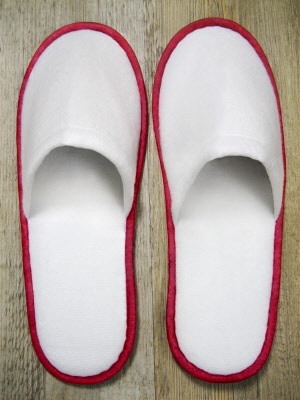 A special, sound-absorbing fabric and an anti-slip sole make the Cocoon slipper an ideal addition to improve the level of hygiene in wet places, such as pools, spas, saunas and steam rooms. Let this welcome gift reflect the quality of your business, whether you manage a hotel, Bnb, guest house or a spa. 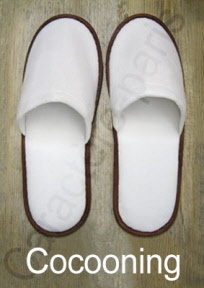 Today, welcome slippers are becoming considered a necessity by international and local travelers alike. 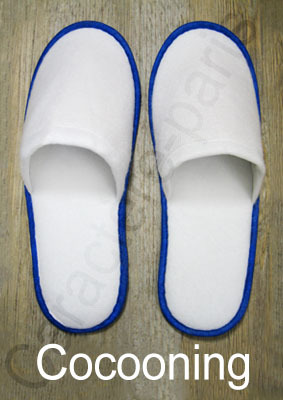 By offering these fashionable and comfortable slippers, you'll build customer loyalty by distinguishing your business from the competition. 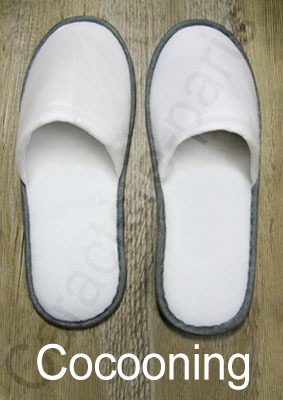 Each pair contains a left and right foot slipper, available in either sizes 6. When you try them for the first time, you can enjoy the best discount! For bulk orders, we can also customize your slippers with a particular logo or design using embroidery, heat transfer or even printed embroidered labels.